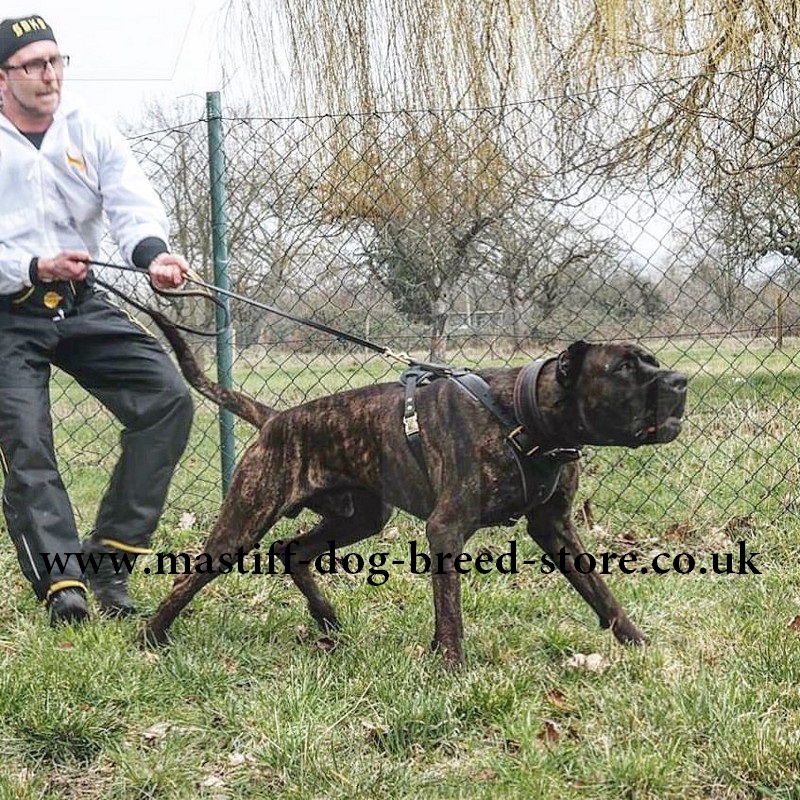 Get a strong, comfortable and professional dog training harness for mastiff. Colors: black and brown. Sizes: S-XL. Mastiff training requires reliable control. That's why our specialists designed a comfortable and extra strong dog harness for mastiff training. Mastiff training dog harness is created by hands of professionals. 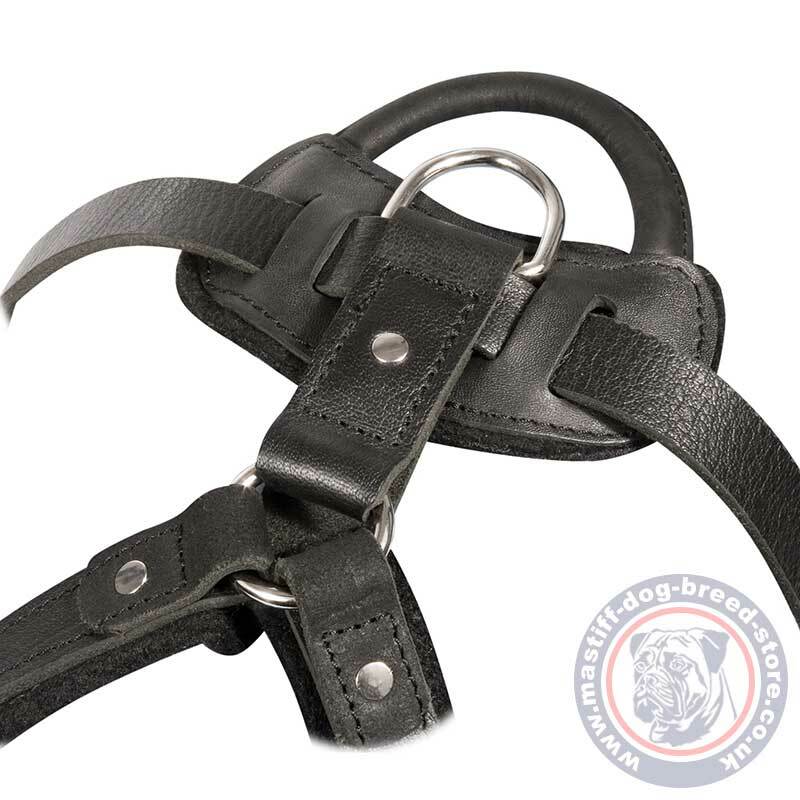 We take genuine leather of high quality to create a super durable, extra strogn dog harness, that would endure the huge power of your mastiff and make its training efficient and comfortable. Mastiff dog training harness is padded. It has soft felt linings at the front and back plates. Soft felt prevents rubbing and protects a dog. 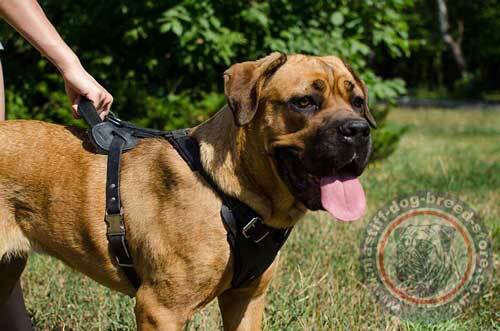 Mastiff training dog harness is fastened with rustproof rivets. The straps are easy and comfortably adjusted by buckles. You may choose nickel or brass plated fittings for the harness. The extra strong dog harness may be even more comfortable and functional. It is available with a handle option for better control over your powerful pet. Extra Strong Dog Harness for Reliable Control with the Handle Option! Turn your attention, that the leather we use is well-done, thick, soft and flexible. It is 3.5 mm thick for super durability. Genuine leather is probably the best material for dog accessories, as it is natural, soft, strong and non-allergenic. Leather items will serve you for a long time if stored properly. You may read the general rules for leather items care at our article.